Lae Lae is a small island in the western Makassar, and it becomes one of favorite destinations in Makassar within 1.5 Km from the city center; in fact, we can see this place clearly straight from Losari. To go to this small island, we can reach for about 10 minutes by using fishing boat and it costs Rp. 15,000 per person from Bangkoa wooden port or it front of Fort Rotterdam. At Lae Lae, there is also other historical site from ancient war, which is underground tunnel that said to connect to the fortress city of Makassar or Fort Rotterdam. 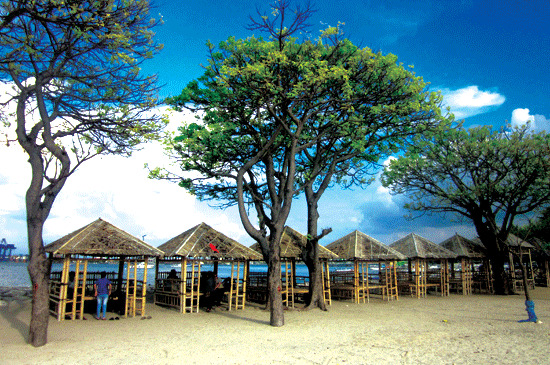 Around the island there are bamboo terrace that been rented as a shelter with prices ranging from Rp. 25.000 - Rp. 40,000. For tourists who do not bring their lunch, around the island, there are many food stalls that providing food and drinks. The Island that located on the west side of Makassar has become one of popular spots for the divers; we can do snorkeling in waters around Lae Lae, swimming or just playing around the place. The Island has clear blue sea with urchins free around the beach; it makes Lae Lae very suitable for those who want to visit the beach and having some fun.